The Irish Wolfhound was originally a war dog, used to drag men out of chariots or off horseback, but was also used as a hunting hound and as a guard. There are numerous reference in Irish mythology to its prowess in all these fields. It was used to hunt the Irish elk and the wolf and was used single or in pairs rather than in pack; hence the need for its great size. When the last of the wolves in Ireland was killed (the elk had become extinct long before), the breed dwindled and almost died out. Because the breed was given as gifts to royalty, this allowed the breed to continue. The Irish Wolfhound should be, and usually is, sweet natured and friendly. Obviously early socialization is important in order to allow the puppy to accept any amount of changes in its environment without becoming nervous and jumpy. Basically the temperament should be sound and the breed should be good with people and with other dogs. However, they are not always good with other animals and that is something that should be kept in mind. 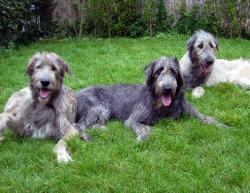 It is important to understand that the Irish Wolfhound, like all the sighthounds, is historically a hunting dog. Dogs are descended from the wolf and all the different breeds have been bred to select desirable characteristics but the different requirements for each breed or type of breed are merely modifications of the natural behavior of the wolf. Although the Irish wolfhound is nowadays known as one of the “Gentle Giant” breed that term has to be put into perspective with natural instincts.